Gideros player features black screen without menu. But it is where it should be though - can you check it's there or not on your system? Well, the plugin is there. I tried reinstalling the program, see the wine settings but unfortunately I did not find what might be causing this "black screen". 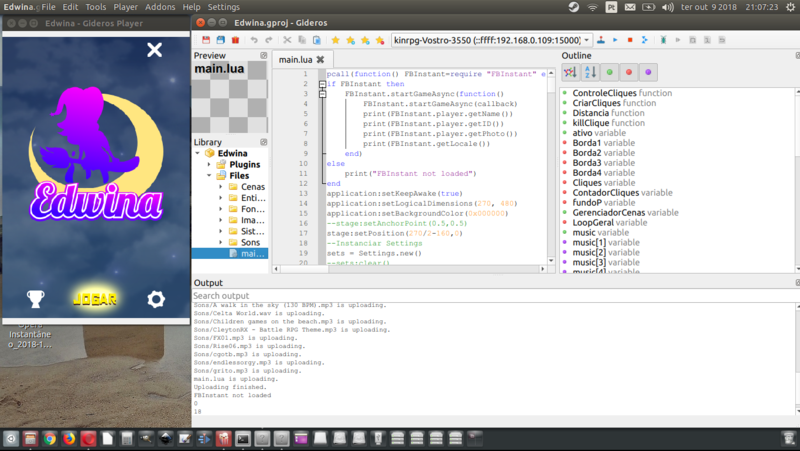 It is playing sounds, displaying the menu when you click the menu bar, and the application running on Gideros Player responds to mouse and keyboard. Should be something in my wine or operating system (Ubuntu 18.04). Because several windows applications that I have, including games, are running normally. All my gideros games in exe is black screen. The best thing to do may be to follow the Raspberry Pi/Linux build instructions and make a full version for Linux - rather than use an emulator (Wine) ? It would be very good a native version for linux. But I never got to do it. I think there are specific Linux build instructions somewhere - or you could follow the Raspberry Pi instructions. I could not install following the instructions. Informed tools and depts are old and confusing. Flee from my ability, since the last day I'm trying to install but without success. I can not afford to pay someone who has a handle on packaging etc. to make an installation easier. 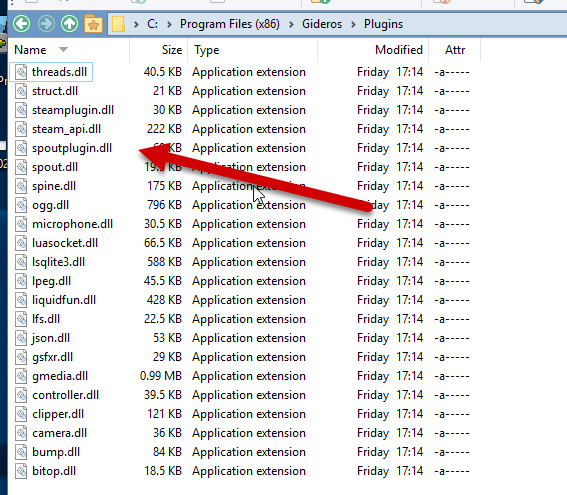 But I am also aware that this is lack of my knowledge and that the program is native to windows. Gidero Studio, Gidero Texture Packer, Gideros Font Creator work normally. Only games using Gideros Windows Player that gets the black screen. Even while continuing to receive clicks and making sounds. A curiosity that shows how the problem is in my system is that the steam games made in gideros that uses the steam play proto to run on linux works normally. I'm programming and exporting to HTML5 or running until I can solve it ... Or, I do not know, install a virtual machine with windows inside or test until you can copy in linux. Well this is the report of the event so far. He had not done that. The only thing I knew was that txt from the dropbox on the site. I'll try out your package and anything, using copilar using the instructions of the following link. I tried to run your compiled package but gave the above message. I assumed it was a problem with the version of my qt, so I downloaded the one indicated in the Gideros wiki that you passed the link but the message continues. That's saying you have 5.9.05 somewhere (0x50905) and you need 5.10.1 (0x50a01). I'm still in the fight. 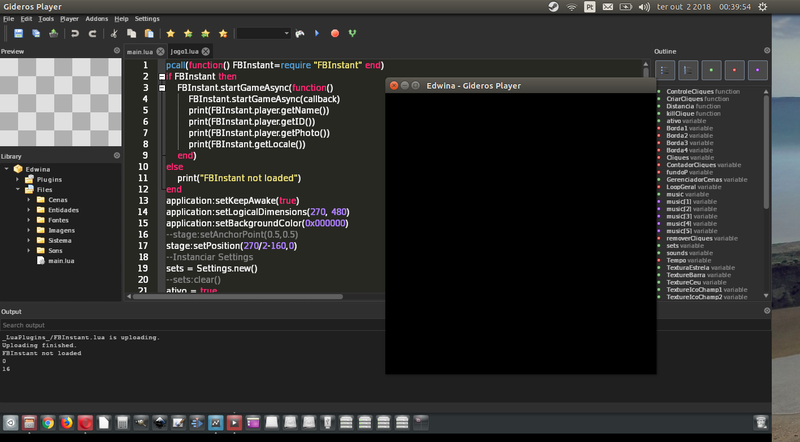 I installed the QT versions, if I give a qmake -v it shows the right version. I was manually hunting every place that points to QT, I installed the full versions of 10, 10.1 and 11. But he still gets to use 5.9 when he's going to run that copied hgy29 package. Worse than mexi in so much, but so much thing here that until the GiderosPlayer of the wine version stopped working. It's strange ... I researched everything in the forum and website ... In several languages I had similar problems but I can not hit the spot on my Ubuntu. "/path/to/my/package" Ai is to place where I unpacked your package? Alias, let me ask. What did you put in Makefile.def? I left it as below because I searched, but I do not know what words it puts in the parameter. In no place did I find out about qt architecture and etc. I want to dedicate this little victory to the friends of the forum and the gigantic patience and support of the friends @hgy29 and @SinisterSoft. Gideros 18.10 copilado successfully on Ubuntu 18.04. @kinrpg thank you very much for the contribution and effort also. 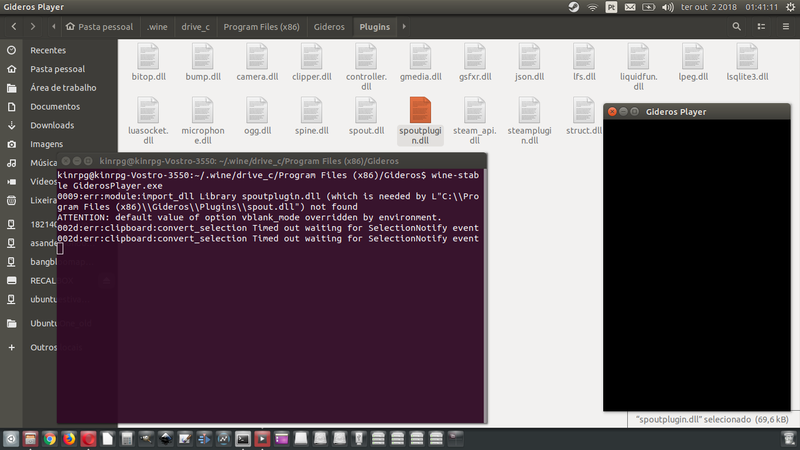 Good thing the GiderosPlayer of Linux now turns black that neither the version via wine. Today I turned on the computer, and both GiderosPlayer linux and windows (running with Wine) were running normally. I do not know what happened but I'm happy to get back to normal. I am here giving a "feedback" about the problem I was having with Gideros Player on my computer with Ubuntu 18.04. After uninstalling these graphics drivers (running the standard Ubuntu video drivers) Gideiros Player came back to work normally, which encouraged me to do a simple game for a gamejam . Many thanks to everyone who has helped me. It is much more practical to natively run applications. But, although the Gideros Player itself is running. All menu options for screen resolution in both Hardware and Zoom and Setup are not working or being triggered. 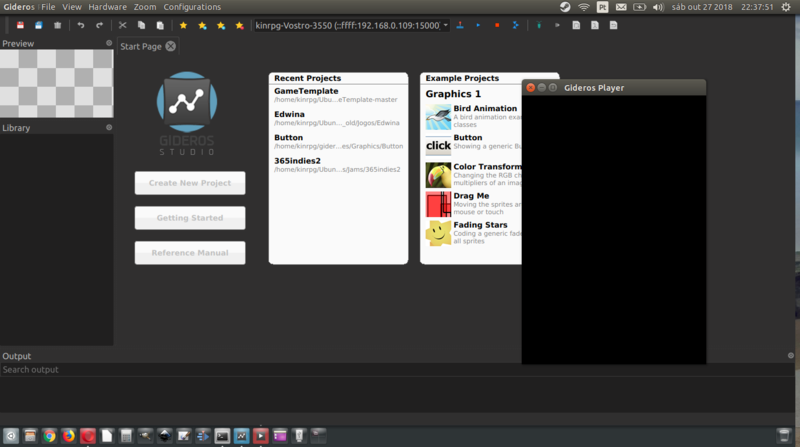 When I need to resize the screen or I leave in fullscreen or click and drag the edges of the Gideros Player window. Thanks for letting me know. I am using the 2018.10 version, as soon as I finish the service here I will download and try to copy the latest version (2018.12?). I have not even found anything on the internet about this "-lGL". Which is?